Those who venture to the Chapada dos Veadeiros National Park, will have the opportunity to witness one of the last reservoirs of pure water on the planet. Bathe in waterfalls with heights of up to 150 meters, and step on soil more than 1.6 billion years old. 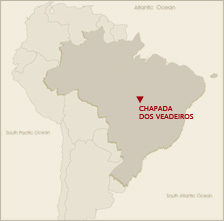 Located in the heart of the country, in the high altitude savannah region of the Planalto Central, Chapada dos Veadeiros enchants visitors with its beauty and natural wealth, as well as for the magic that it possesses. It is considered by many to be the "planetary heart of chakra”.